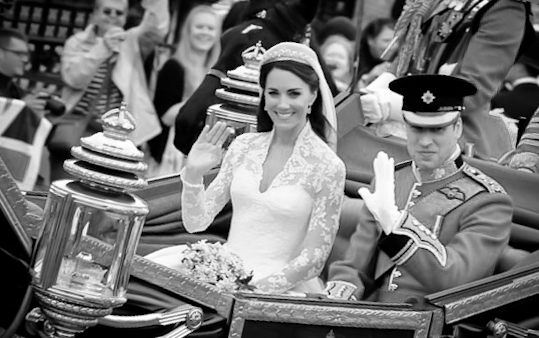 I didn’t really take much notice of the royal wedding that occurred last week between the new Duke and Duchess of Cambridge (Prince William and Catherine Middleton), at Westminster Abbey on April 29, 2011. I had many things going on during the wedding so I didn’t have time to watch the ceremony, but it was widely reported by international news and covered at every angle. Now, I must admit that I’m not really a big follower of the royal family or the British Crown; I’ve noticed that many people are, however – so perhaps I’m alone in lacking a desire to follow the royal family’s sagas. In fact, last time I visited my own grandparents home I noticed that even they have a special Princess Diana decorative plate sitting atop their mantle. So I guess everyone but me is into royalty! So I figured I should see what all the fuss was about and I took a look at some of the royal wedding images. I must admit that I kind of enjoyed seeing the royal wedding photos. They are really colorful and perhaps most royal weddings offer such great pomp and amazing color, so I was impressed. I kind of wondered what it would be like to photograph the royal wedding. I’ve never photographed any royal weddings (I pretty much stick to the commoner, american weddings) but perhaps it would’ve been fun to photograph the royal family! At any rate, the official wedding photographer for the royal wedding was Hugo Burnand, and you can view some of the official photographs from the wedding at his website. According to this article, Mr. Burnand had only 26 minutes to capture the wedding images! I can tell you from experience that 26 minutes is not very long in wedding photographer terms, so he must have been snapping away! The trick to being a decent wedding photographer is anticipating what will happen next, which he must be pretty good at, otherwise the Royal Family probably wouldn’t have hired him for such a prestigious event. There aren’t as many photos available as I’d imagined in this new digital world that we live in, but you can sort of put the pieces together. Just do a Google search for “Royal Wedding” or “William and Kate Wedding” and then select “images at the top of the browser. There are photos on many different pages. Enjoy!